Time for Red Hill Brewery to bring down the curtain on its year long tenth anniversary celebrations, celebrations marked by the release of ten new red beers. Numbers nine and ten are kegged, bottled and in venues – and they are a session IPA and wild cherry saison. 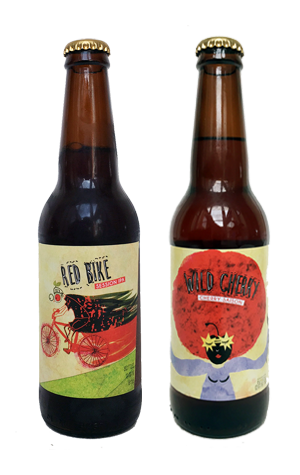 The former is the Red Bike, inspired by the mountain bike trails that surround the Mornington Peninsula brewery; the idea being to create something light enough to knock back at the end of a ride but flavoursome enough to satisfy the tastes of their crafty clientele. It might not pour the reddest of reds but it has to be one of the most overtly hoppy of all the beers released by Red Hill in the past decade and more. There's heaps of fruity apricot and citrus aromas at play before the sweet caramel appears followed by a drying grassy finish. As for the Wild Cherry, it features fruit sourced from a local grower and is a nod to the land on which they brew: formerly a cherry orchard. It has a pinky hue and the prickly carbonation you want from a saison. The fruit adds soft berry / cherry aromas and a tartness, without dominating the more traditional saison yeast characters. It all wraps up nice and dry too.